Toby came into our lives in mid July as a fuzzy black ball of mischief intended to be a safeguard against burglaries. It has been a long time since we have had a baby in the house and it has taken us some time to become accustomed to her needs. She is now a gangly adolescent slowly learning the ways of the tall people in her life. It is as delightful to see her explore her new world as that of a wide-eyed toddler. Her first encounter with the fish pond in the back yard came as a surprise. It is a solid layer of green duckweed, and so she thought it was a funny kind of grass and proceeded to ‘walk ‘ across it. Total shock occurred when she became thoroughly wet and needed rescue. Several weeks later, I had tired of her racing around the house atop all the sofas and chairs, grabbing assorted items as she ran–all at the speed of lightening it seemed. I devised a plan in which she would be tethered to a stake outside near the pond and my arbor. Here I could toss a toy for her to retrieve and she could run about without harm. 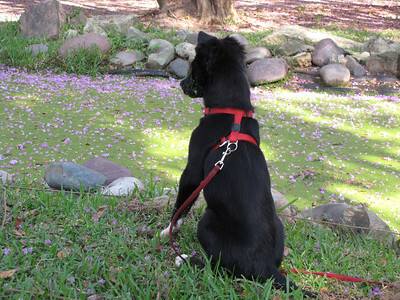 Her first inspections of the pond were tentative, one paw dipping into the water to see if it was solid. She soon discovered bits of roots and twigs and clumps of grass that had fallen into the pond. Her tentative dips turned into pond-dredging efforts all from the sides of the pond. Once the items had been retrieved from the pond, she turned her attention to shredding them into tiny bits. She has not ventured into swimming, the tether preventing her from exploring too far. Perhaps I can hire her out as a pond cleaner and compost maker.